"This milkshake is fantabulous! Chocolate ice cream, chocolate syrup, chocolate drink mix and chocolate chips are all whirled together with milk to produce a concoction so chocolaty, that it is sure to make you tingle." 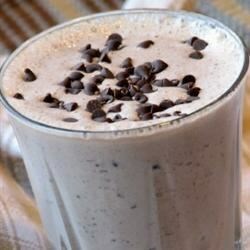 In a blender, combine milk, ice cream, chocolate syrup, chocolate drink mix, ice cubes and chocolate chips. Blend until smooth. Pour into glasses and serve. See how easy it is to make a thick, creamy chocolate shake. Oh, my kids were excited about this one. Chocolate, blended with more chocolate, and then more chocolate on top of that. Huge hit! It's delicious, though not nutritious. :D sorry bad rhyming there. I love the idea of chocolate chips! Picture helps a lot, and yummy yum yum! Thanks for the AWESOME recipe! I used hot chocolate drink mix instead of chocolate drink mix, but otherwise made exactly according to the recipe and it was so good! I will be making this often! I love chocolate milkshakes. Not so fond of the chocolate chips though. The pieces kind of froze and were crunchy. It might be because of my blender though?